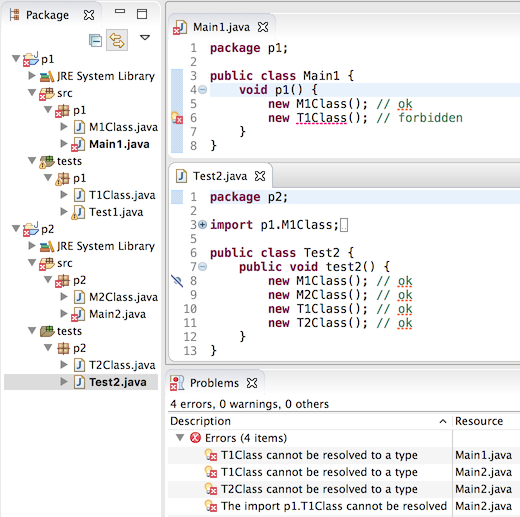 Then select a source folder in a Java 9 project in the Package Explorer view and use Ctrl+V (Edit > Paste) to paste it. 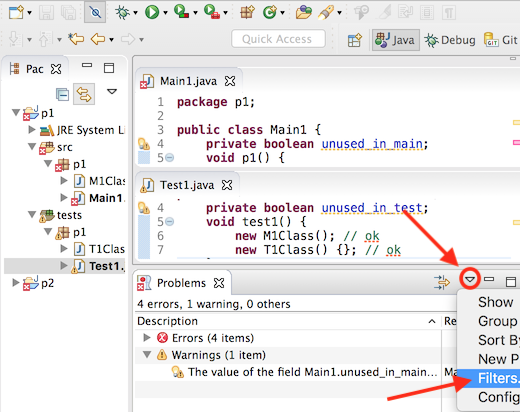 This automatically creates a module-info.java file in the source folder with the copied content. 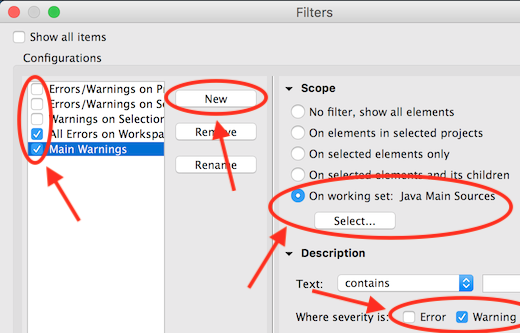 You can use filtering to display only settings with names matching a specific phrase. 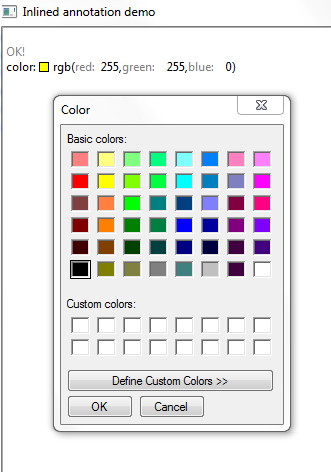 Filtering by values is also possible (prefix a value filter with a tilde). Most sections have a "Modify all" button in their header that lets you set all their preferences to the same value with one click. 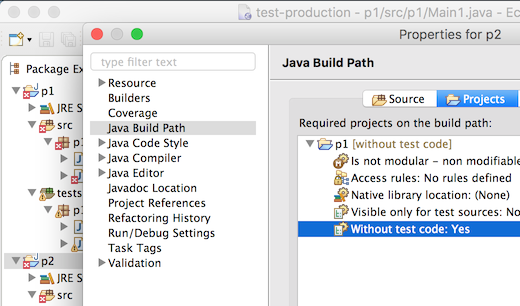 Test sources In the Java Build Path project settings, there is now an attribute Contains test sources to configure that a source folder contains test sources (Note: test sources must have their own output folder). 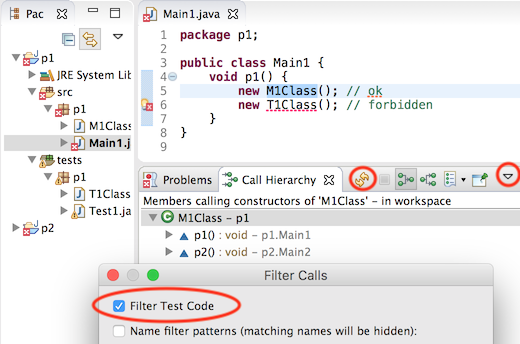 Similar, for projects and libraries there is an attribute Visible only for test sources. This setting also exists for classpath containers, and if it is set to Yes for one of these, this value will be used for all contained libraries and projects. Similar, when an exception breakpoint is hit, the exception being thrown is shown. 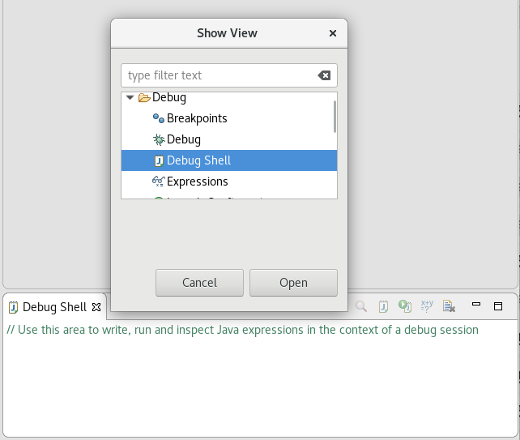 Display view now named Debug Shell The Display view has been renamed to Debug Shell to better match the features and purpose of this feature. 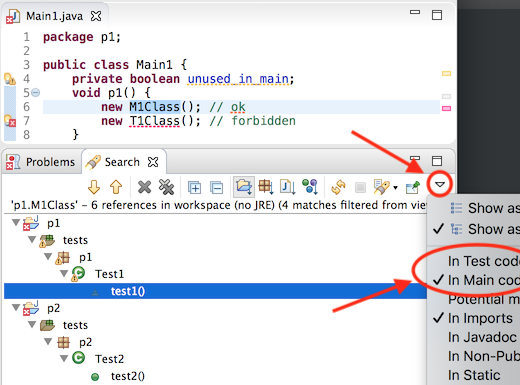 A line of Java comment have also been added to the view on fresh open to encourage trying it further. 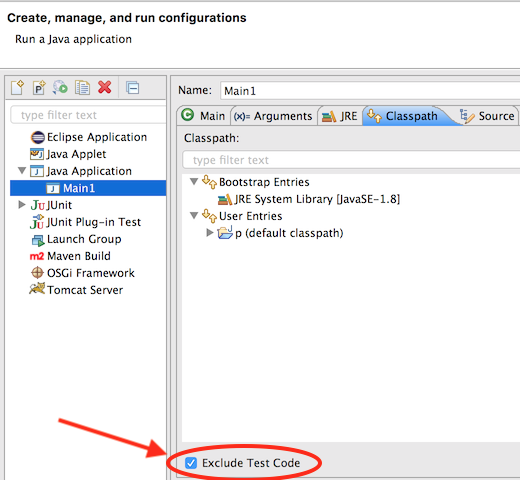 Once a Java Launch Configuration has been created, you can override any initial settings from the prototype. 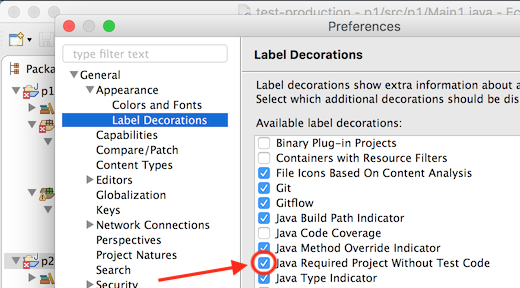 You can also reset the settings of a Java Launch Configuration with the ones from its prototype. 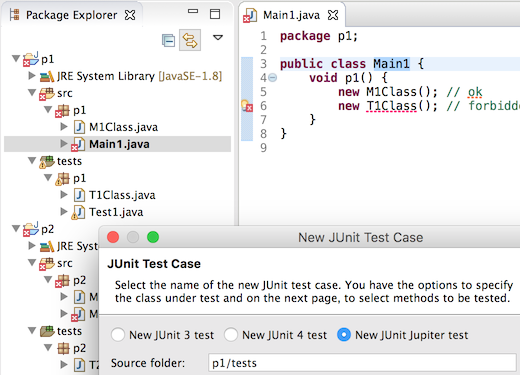 A Java Launch Configuration maintains a link to its prototype, but is a complete stand-alone launch configuration than can be launched, exported, shared, etc. Another example would be to search for all modules that start with java.x followed by zero or more characters which is given by the regular expression /r java\.x. * - note the backslash for . to consider this as a "normal" character instead of the special regex]. Yet another example would be search for all module names that start with j followed by zero or more characters and ending with .xml which in regex language translates to /r j. 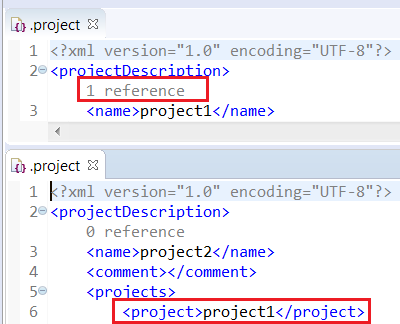 *\.xml and here please note that the first '.' is the special regex character while the second '.' is escaped to denote that this is a normal character. PDE handles generic bundle requirements/capabilities PDE now handles dependencies described by the Require-Capability and Provide-Capability manifest headers. These dependencies are taken additionally into account when computing the required bundles for a selected set of bundles from the target platform. 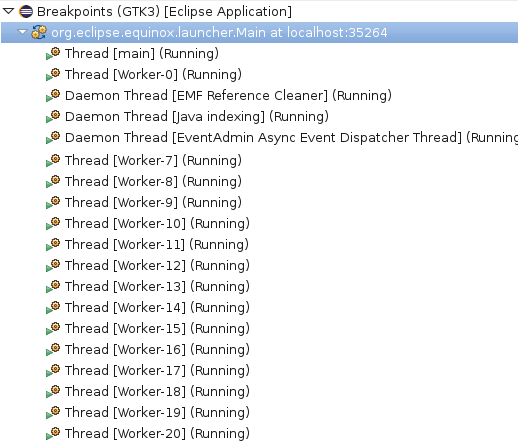 The most noticeable place where this feature is in the Eclipse launch configuration page i.e. 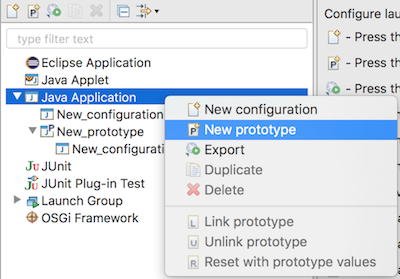 Eclipse launch configuration -> Plug-ins -> Add Required Plug-ins For example, a usual effect is that the plug-in org.apache.felix.scr with the dropdown "Launch With: plug-ins selected below" selected on Plug-ins tab. will be additionally selected by the action. This plug-in declares Provide-Capability: osgi.extender, which is consumed as Require-Capability: osgi.extender by some plug-ins. Further the computation of required plug-ins is performed recursively now until added plug-ins do not introduce more transitive requirements. 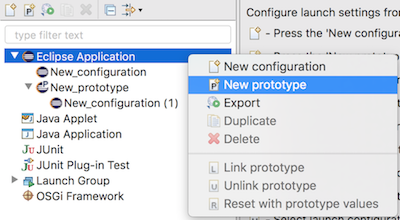 Launch configuration prototypes for Eclipse Launch Configurations An Eclipse Launch Configuration can now be based on a prototype. 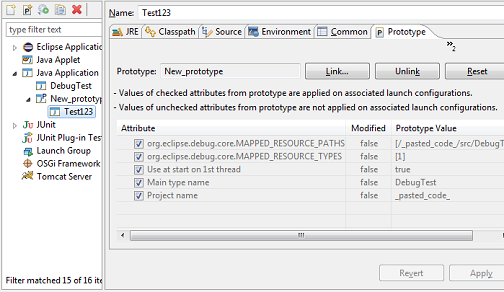 A prototype seeds attributes in its associated Eclipse Launch Configurations with the settings specified in the Prototype tab. 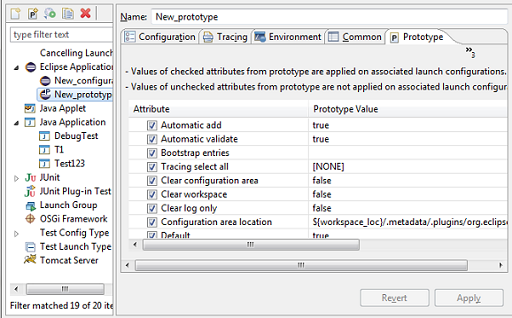 Once an Eclipse Launch Configuration has been created, you can override any initial settings from the prototype. 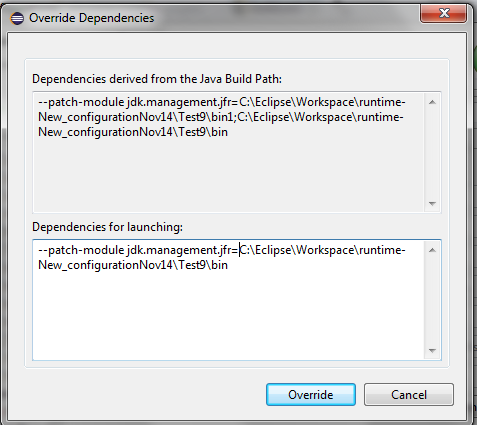 You can also reset the settings of an Eclipse Launch Configuration with the ones from its prototype. 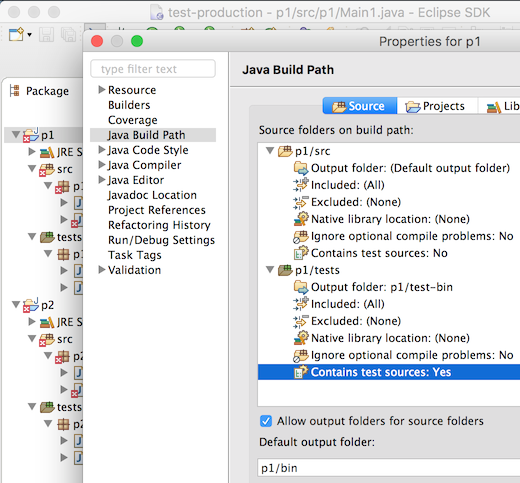 An Eclipse Launch Configuration maintains a link to its prototype, but is a complete stand-alone launch configuration than can be launched, exported, shared, etc. 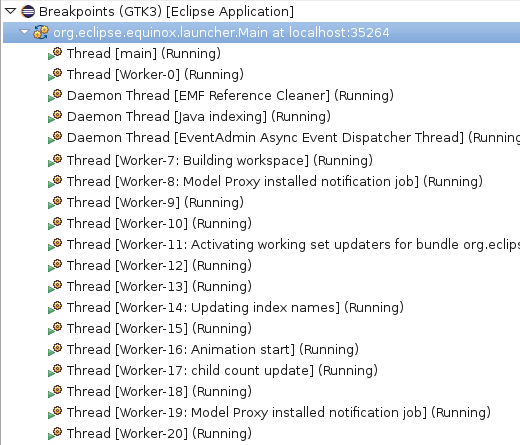 CodeMining provider Extension point The org.eclipse.ui.workbench.texteditor.codeMiningProviders extension point gives the capability to register code mining providers org.eclipse.jface.text.codemining.ICodeMiningProvider in text editor using ISourceViewerExtension5. Associating providers via this extension doesn't automatically enable code-mining, so that clients are also supposed to use a reconciler or whatever event mechanism to invoke ISourceViewerExtension5.updateCodeMinings(). For instance you can consume the org.eclipse.jface.text.codemining.CodeMiningReconciler to update the registered CodeMining providers. 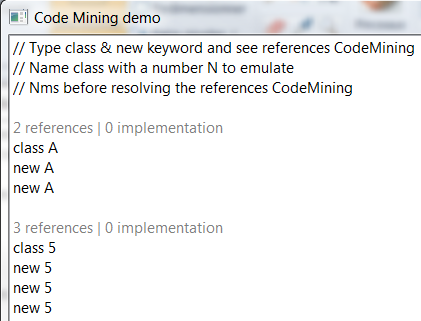 This code mining provider is updated with the org.eclipse.jface.text.codemining.CodeMiningReconciler reconciler. 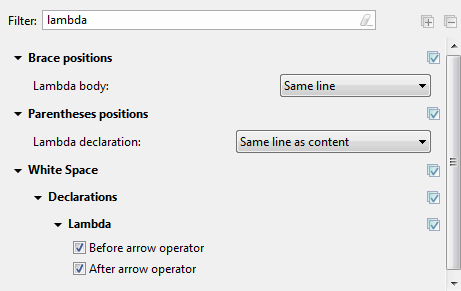 Action for Inlined Annotations Inlined annotation can define an action to execute when you click on the annotation with Consumer<MouseEvent> getAction(MouseEvent e). Launch configuration prototypes A launch configuration can now be based on a prototype. 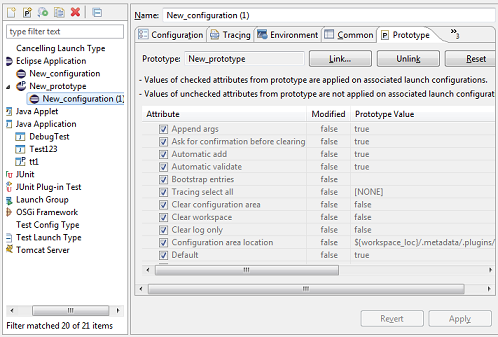 A prototype seeds attributes in its associated launch configurations with the settings specified in the Prototype tab. Once a launch configuration has been created, you can override any initial settings from the prototype. You can also reset the settings of a launch configuration with the ones from its prototype. A launch configuration maintains a link to its prototype, but is a complete stand-alone launch configuration than can be launched, exported, shared, etc. and also implement org.eclipse.debug.ui.AbstractLaunchConfigurationTab.initializeAttributes() for their specifics tabs. New API getOffsetAtLocation(Point) added to StyledText The new method StyledText#getOffsetAtPoint(Point) is a replacement for StyledText#getOffsetAtLocation(Point). It behaves similar, except that it does not throw an IllegalArgumentException when no character is at the given location, but returns -1 instead. Using the new method will result in better performance when used in tight loops. 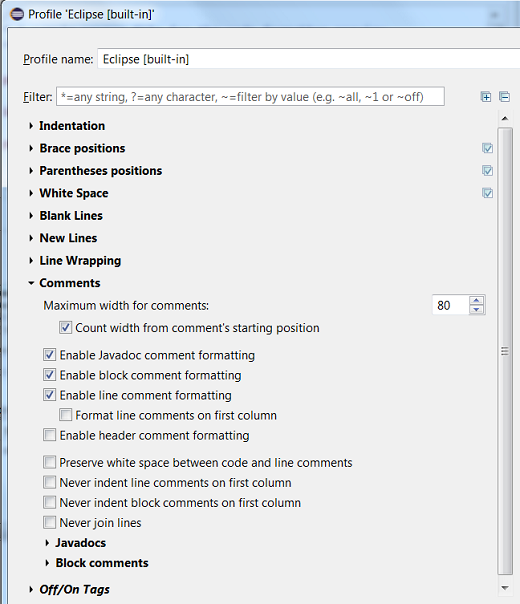 Especially the Show Whitespace editor feature benefits from using the new API. The method StyledText#getOffsetAtLocation(Point) has been deprecated. New event SWT.OpenUrl added A new event type SWT.OpenUrl has been added to SWT to notify clients that an URL should be opened. Listeners for OpenUrl event should be added to a Display. The event's text field contains the URL to be opened. URLs can be passed to Eclipse in the same way in which file paths are passed from the command line (i.e, as arguments to the default action --launcher.openFile). An URL can also be passed by configuring a custom URL handler for the platform. Webkit2 is now the default Browser renderer on Linux/GTK Preliminary support for Webkit2 on Linux/GTK was added in Eclipse Luna. Webkit2 support is now complete and has replaced Webkit1 as the default renderer for the SWT Browser widget on Linux/GTK. Webkit1 was known to crash at times. Webkit2 is stable and runs in a separate process, thus providing enhanced performance and is more secure. See Webkit2 port bug for more details.